No it isn't. Anyone with the proper feature set can do tile based deferred, most next gen games are going to be culling light lists out on something like an 8x8 pixel per tile basis, whether that's for forward rending or deferred. Which sounds exactly like what you described. No, I don't think you quite get it. Culling lights in tiles is something different. In this case the geometry is batched up before drawing, then binned to tiles, and then the visibility (z-order) is solved on a per-tile basis. It may sound the same as deferred rendering tricks in software, but it is not quite the same. These software tricks depend on multiple rendering passes, with z/stenciltesting to determine which pixels to shade. 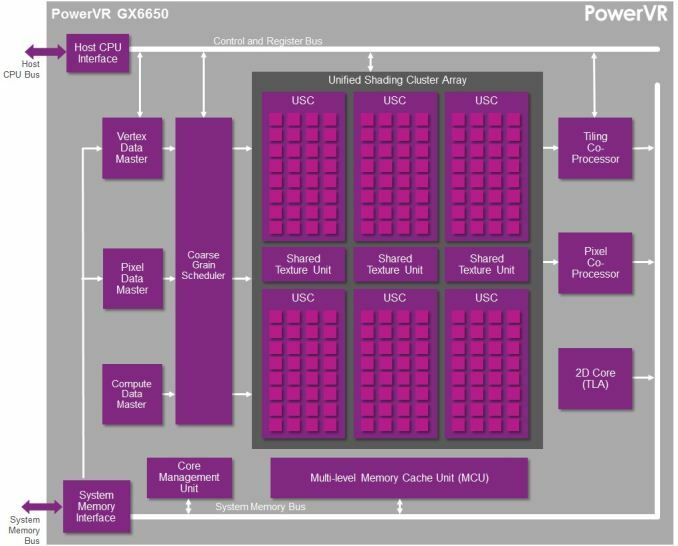 PowerVR can do it in a single pass (as far as the software is concerned). Exactly, the Z-buffer is on chip. Incidentally, Multi-sampling AA increases your Z-buffer and framebuffer bandwidth requirements by a factor of x (for 4x AA). What if that were all on chip?